A quartet of high-flying accountancy staff have smashed their fundraising target after jumping out of a plane for charity. After three postponements due to weather challenges, the thrill-seeking team from EQ Chartered Accountants were finally given the go-ahead to exit the aircraft 10,000 feet above the ground at Fife Airport in Glenrothes on Tuesday 24 July 2018. Combined with a host of other activities and events held so far this year, the firm has now raised over £6,500 for their charity of the year, Maggie’s Centres, with more than £2,600 raised in relation to the jump alone. 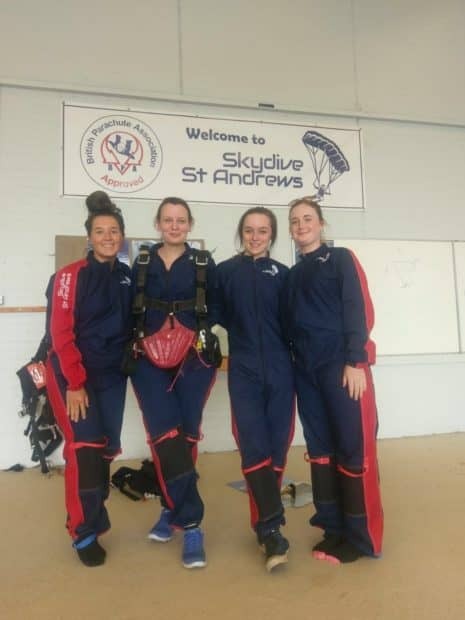 The sky dive fundraiser saw Rachel Bell (Senior Manager), Katie Edward (HR Assistant), Hannah Grubb (Trainee Accounts Assistant) and Laura Hutt (Marketing Co-ordinator) dive through the air at up to 120 miles per hour before the instructor deployed the parachute at around 5,000ft. Next month, staff from Dundee and Cupar will take part in the ‘MacTuff Girls Big Dirty Day Out’, an obstacle course in Falkirk, with a team from the Forfar office taking part in ‘Rough Runner’ during the same weekend. In September, the Glenrothes office is hosting a race night and staff from all offices will take part in the ‘Maggie’s to Maggie’s Trek’. With a spooky Hallowe’en themed bake sale in October and a Charity Ball in November, the year will be topped off in festive style, with a Christmas Jumper Day! EQ is also sponsoring a penguin as part of this Summer’s Maggie’s Penguin Parade which is well underway across Dundee and surrounding region. The project is led by Maggie’s Centre Dundee, in partnership with Wild in Art, and will raise significant funds to support Maggie’s vital work caring for local people affected by cancer. The EQ penguin is designed by Ulrika Kjeldsen.